I’m sure you all have noticed my polka dot obsession. I wrote a post not too long ago about how I wanted to add different things to my closet, and maybe tone down my love for polka dots. I think that may be impossible though. 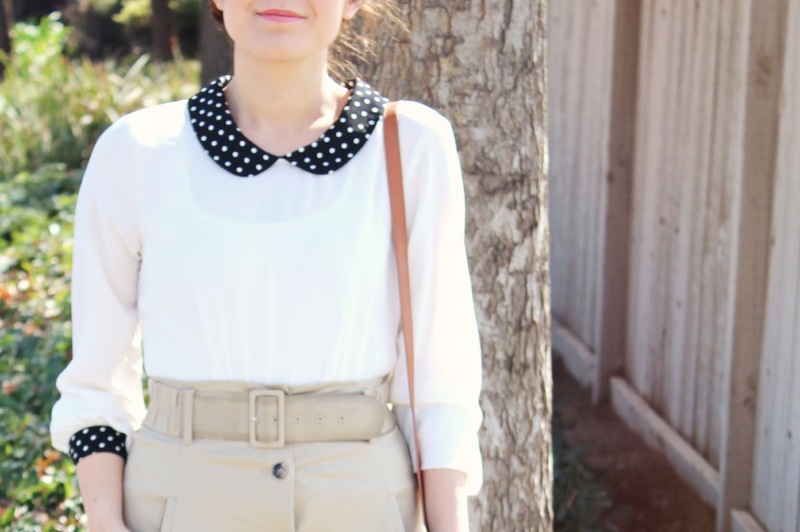 Needless to say, polka dots are here to stay! I just can’t stay away from them. I guess I can say that polka dots are my spirit print! I am a big fan of dresses and skirts with pockets. I think they not only look neat, but they also come in handy. I’ve had this skirt for a few years now, and I’ve always loved it. It’s one of those timeless pieces that I’ll probably never get rid of. I also like the fact that I can dress it up or down. I thought I would add a little pop of color to these neutrals I was wearing. 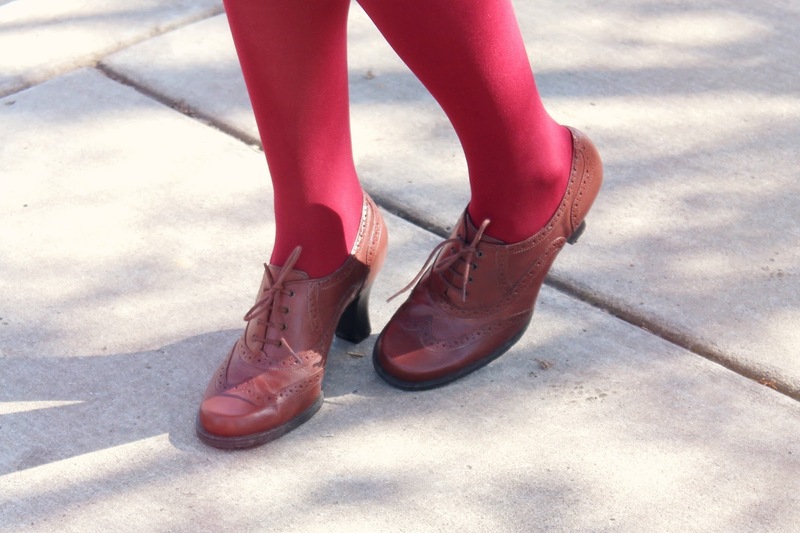 Colored tights always do the trick. On Sunday, I decided to dress up a bit for a date with the hubby. We had a great weekend. We got to watch a movie, eat some good food, and spend some quality time together. It was awesome. p.s. so glad i stumbled across your blog and instagram. you are my new favorite! I just found your blog via instagram :). You have such amazing style 🙂 and i'm looking forward to your future posts :). I love the blouse and your adorable hair! Twitter “recommended” you blog to me and am so glad they did, I love your style and can't wait to see more! Happily following along on GFC now, hope you're having a wonderful day! Skirts and dresses with pockets are always a plus. Especially, at concerts. I cannot wait for my hair to grow longer so I can do pretty milk maid braids like this. You look so lovely. I have to say.. you make the most charming faces when you pose! Youre adorable! I love your hair and your blouse!Your blog is amazing and I love it so I am your new follower. Love your top and your shoes! i am in love with all those things too! & you! You have no idea how glad I am to have found your blog! I absolutely adore your style!! (Don't worry, I'm obsessed with polka dots too!) Great shoes! Everything about this outfit is stunningly adorable. 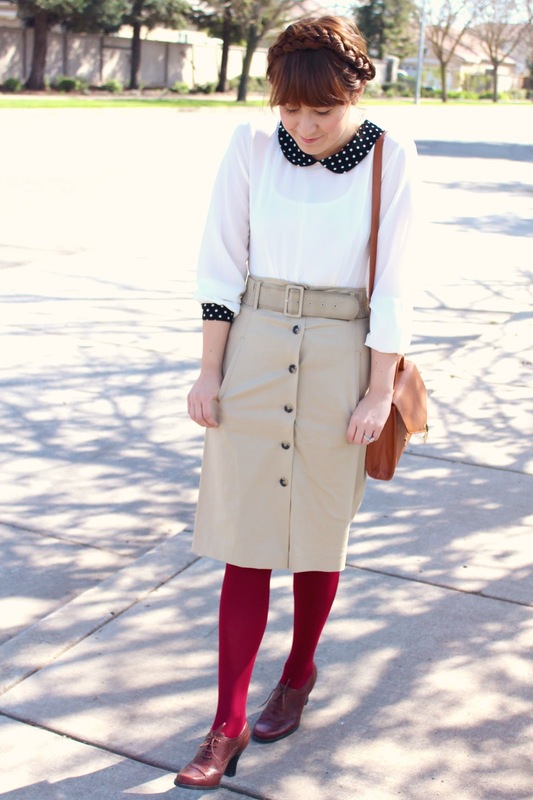 Your hair, the polka dots, the peter pan collar, red tights, oxfords – ahhh! GORGEOUS. Your style is so fun and unique.